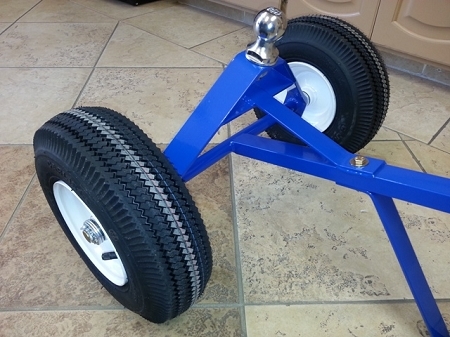 This completely redesigned heavy duty trailer dolly is made here in the USA and has been beefed up for heavy loads. It can handle a tongue weight of up to 1000 pounds and attaches to the HD2 or HD4 quickly and makes going up the trailer ramp a breeze. You can also use it to move your loaded or unloaded single axle trailers around. This is a universal tool for only $226.00 that everyone should own. 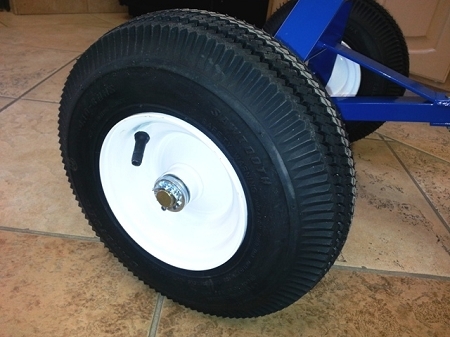 This Heavy Duty Trailer Dolly is manufactured by us with 4 ply tubeless 13" tall tires, solid 3/4 axle, heavy duty wheels, and high-quality roller bearings. The wheelbase is narrow to clear the HD2 or HD4 handlebars on rough terrain. The trailer ball is 1 7/8" so it slips right under your hitch. The trailer dolly ball does not need to be bigger because it's made to just move trailers around and not go down the road at high speeds. The ball sits 16.5" tall from the ground to the top of the ball. This product ships free with the purchase of any MD or HD series dolly. We bought a trailer dolly from harbor freight and it broke as soon as we used it the first time. My husband ordered this trailer dolly and its really strong. We did have to put it together but you can tell it's made very well and my husband was really happy with it. 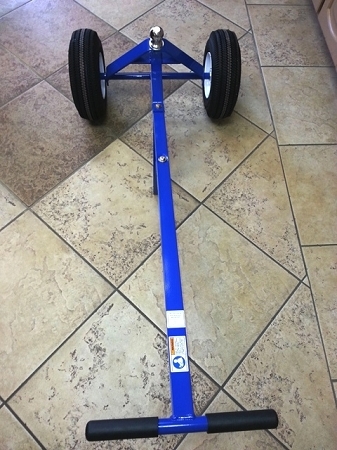 Bought this heavy duty tailer dolly because the trailer dolly we have could not handle our 900-lb enclosed trailer. This one, on the other hand, makes moving the trailer a breeze! We also use it in conjunction with our heavy duty hand truck to move inflatables around. absolutely saves my back and my bad knees. this attachment makes any trip worth it moving units especially into the trailer! Will always recommend this company! best service around no joke! A: The tires are 13" tall, (13x500x6) The ball height from the ground to the top of the ball is 16.5" and it weighs 45 pounds. Q: I have a 20' bass boat and tandem trailer. Package weight empty is a little over 4000 lbs. Which dolly will handle this load on minimal incline? 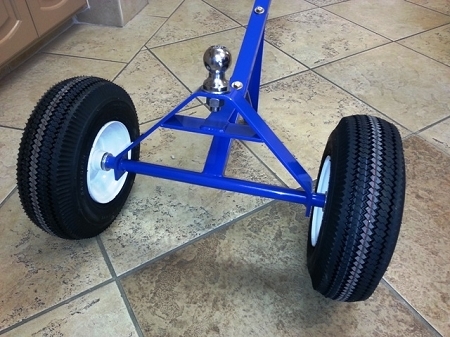 Our trailer dolly is not recommended for tandem axle trailers or for use on inclines. Our trailer dolly will handle the weight but a 4000-pound trailer can get away from you pretty fast on an incline. The problem you will have with any manual trailer dolly is trying to turn a tandem axle trailer. It doesn't have enough weight to actually turn the trailer and will just flip over.